« Complete heart block with significant CAD . . . How will you manage ? How to measure and quantify epicardial fat ? Epicardial fat is increasingly recognised to be a coronary risk factor. Methods to measure and quantify epicardial fat has not been standardised. There is some confusion in the literature regarding the definition epicardial, pericardial , paracardiac fat etc. Epicardial fat is the true visceral fat located in proximity with myocardium .Epicardial fat shares the same blood supply as adjacent myocardium and also show para-crine functions.This is the risky fat that is metabolically active. Paracardiac fat is the fat deposited outside the parietal pericardium .It is also referred to as thoracic fat .They carry less risk and behave more like somatic non visceral fat. Pericardial fat is a loose terminology .Many use epicardial and pericardial fat interchangibly .It is to be realised , fat either deposit inside the visceral pericardium or outside the parietal pericardium. It almost never deposits within the pericardial space. * Currently it is better to use only two terms .Epicardial fat and thoracic fat .Other terminology should be avoided. Distribution of fat over heart is not uniform .Though it appears a random distribution there app eras to be a pattern to it .It is largely loaded anterior surface of the heart, over the AV grooves, invariably hugging the coronary arteries and great vessel origins.Fat deposition posterior to heart occurs in gross obesity. There is no accurate way to quantify it . A rough estimate can be arrived . The following investigations are useful. Epicardial fat pad thickness by M-Mode /2D is simplest, but considered crudest modality to quantify. .Still , it is a useful screening test. In our experience , if there is distinct anterior fat pad > 5mm it is likely to be significant. Which part of cardiac cycle it is measured ? Since epicardial fat is a compressible structure , in diastole the myocardial mass encroaches the epicardium any imaging modality the distinction between epicardial and para-cardiac fat tends to attenuated. Even MRI images obtained with diastolic gating , may not be reliable .End systolic frames are now considered ideal. What is the normal epi-cardial fat volume ? How to differentiate fat from pericardial fluid ? It can be a very difficult issue especially when you expect both as in hypothyroidism .It needs proper gain settings and interpretation. Can we measure the net mass of cardiac fat , does it compress the heart ? When we say average heart weighs 300 grams it includes fat embedded in it. 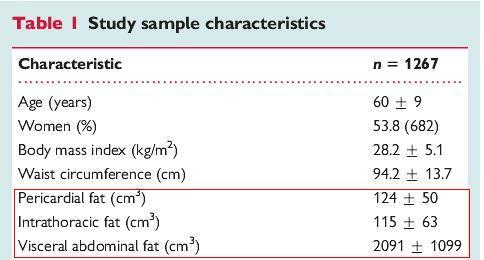 I don’t think it is possible to measure the fat mass ,but clinically it may be important.Read this .Can-epicardial-fat-constrict-the-heart-an-authentic-yes-from-ulsan-korea ? Estimation of epicardial fat volume is largely a research tool.In grossly obese patients it may have some clinical utility.Increased anterior fat pad in routine 2D echo is an useful screening test. However, it requires MRI/CT imaging for accurate quantification. 3. Sarin S, Wenger C, Marwaha A, Clinical significance of epicardial fat measured using cardiac multislice computed tomography. Am J Cardiol. 2008 Sep 15;102(6):767-71.